A dark new moon rises in the sky, the 7th of the year. It is then that the fiery gates of hell open and the ghosts of below are allowed to walk amongst us. Penang itself is a cultural melting pot with a harmonious multiracial & multi-faith populace. It holds a number of religious festivities throughout the year and it’s a great place to see the Hungry Ghost festival - if you don’t mind your own vacation intertwining with a tour group from hell. Literally. The Tao in Taoism is ‘the ultimate creative principle of the universe’. All things are unified and connected in the Tao. It is a religion of unity and opposites. Dark to bright - Yin and Yang, positive and negative. The idea that everything in the universe consists of two forces that are opposing but complementary. For there to be life, there must be death. A heaven and a hell. Living or not. That dualistic thought process holds logic that most can associate with and at least, use the principles to make sense of a confusing world. In Taoism, there’s an understanding that it’s difficult to live a completely sinless life. We are human and are guilty of making mistakes. Even just small ones. When you die in this realm and your spirit heads towards the gates of hell, you’ll be met by hell’s police. Demonic horse and bull headed giants that will direct you to your next destination. There are 18 levels of hell (Diyu) here, subsided into 10 courts, each with its own judge. You’ll be convicted and punished accordingly to the levels of your crime in which you must atone for your sins before making your way to paradise. The 7th lunar month of the Chinese calendar, Taoists believe that the gates of hell are opened. Wandering souls are invited to our realm. These spirits are the ancestors of the living world that have not yet made it to paradise. If they are not appeased then the living will face the wrath of the dead and misfortune will be placed on their lives. For the duration of the month, meals are prepared and made as offerings three times a day, as well as huge joss sticks that are lit in and placed in rows around the cities temples - the larger the joss stick the more good luck and prosperity your year will be blessed with. Gifts and ‘hell money’ are set alight each evening outside of their homes as further offerings. Nightly entertainment is also provided for the spirits. There are stages set up in various places in the quiet suburbs where Hokkien, Cantonese & Teowchew opera is performed each night of the month. 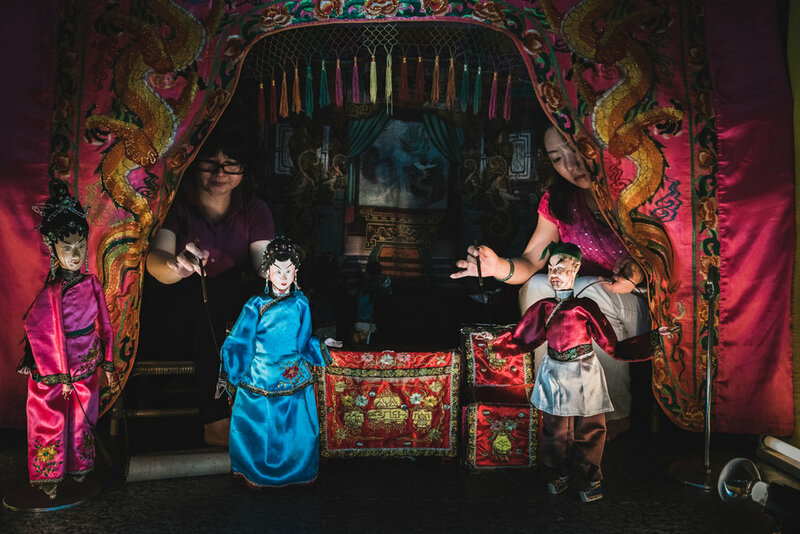 Traditional Hokkien and Teowchew puppet shows are also performed around the city. At the entertainment events, you’ll often see the front row of chairs empty with a small offering placed beneath. These are strictly reserved for the unseen visitors. There are many superstitious beliefs that one would adhere to during the month and failing to follow these can land you with bad luck or even worse, an evil spirt taking host over your body. The pavements transform into a minefield, strewn with joss paper, charred offerings, and food and should not be trampled on. Swimming should be avoided as it is believed that vengeful spirits whose death was due to drowning are determined to take the living with them. Staying out late at night, picking up strange items such as coins from the street floor, wearing red or black clothing, looking under the altar or offering tables, whistling at night or starting into new business or personal ventures all hold similar consequences for failing to follow. The final day of the festival is the most lively. A huge celebration takes place throughout the streets, centred around each of the Chinese Temples. The effigies are lifted from their foundations and carried through the streets with a troupe of devotees trailing behind. People are joyous and hurl wads of hell money into the night sky with an erupting cheer. The giant paper figures are then brought to their final resting place, a pre place mound of colourful paper which adds to the fuel of the bonfire that follows. As the fire takes hold, people drop to their knees to give thanks and make prayer. More offerings are made and more hell money is thrown to the fire. The atmosphere is electric: the roaring fire and crackling ambers that float between the shrills and applause of celebration. I visited two final eve celebrations. One on the mainland and the other through the streets of Georgetown. The procession led through the old colonial streets with drummers and Chinese dragons dancing around the falling hell money. This event was led by a head priest. He started the night in a peaceful state, tuning into the spirits that were on their way back to hell. As the atmosphere became more lively and chaotic, the head priest fed off the mood and became more animated, running through the devotees and being directed by his surrounding helpers. He was calmed down and given a stool to sit on. As he was given alcohol and cigarettes, he went into a trance, rocking back and forth and mumbling to himself. Cards were given to him and it appeared he was taking instructions from the spirits. An occasional word was shouted out; a number. It's thought that the numbers he collects would be lucky numbers for the year. As the effigy was set alight and the flames grew bigger, the priest awoke from his trance. He was agitated and uncontrollable. Possessed almost. Without warning he alluded his helpers and leapt into the fire. A devotee grab his arm at the last minute which dropped him on the edge of the fire. A group rushed to pick him up. He was unconscious and had burn marks up his legs. The was the last I saw of him as he was carried out through the crowd. And as fast as the fire turned to burning ashes, the crowd dispersed and a group moved in to douse the flames with water and begin cleaning up. If you were to arrive a day after the gates of hell are firmly shut, you’d be none the wiser for the evil that walked the streets during the month prior. It’s business as usual for the people of this realm. Until next year, you’re safe.